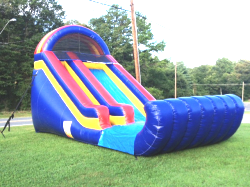 The 16′ Inflatable Water Slide rental is perfect for all ages, but specifically designed for smaller age groups. The 12′ tall slide platform is not too high for kids ages 12 and under, but not too short for teens or adults either. This Water Slide would be the perfect addition for any event! This Water Slide was a waved end to protect your kids from falling out of the slide.